Free trade agreements are treaties that regulate the tariffs, taxes, and duties that countries impose on their imports and exports. The most well-known U.S. regional trade agreement is the North American Free Trade Agreement (NAFTA). Increased Economic Growth: The U.S. Trade Representative Office estimates that NAFTA increased U.S. economic growth by 0.5 percent a year. More Dynamic Business Climate: Often, businesses were protected before the agreement. These local industries risked becoming stagnant and non-competitive on the global market. With the protection removed, they have the motivation to become true global competitors. Lower Government Spending: Many governments subsidize local industry segments. After the trade agreement removes subsidies, those funds can be put to better use. Foreign Direct Investment: Investors will flock to the country. This adds capital to expand local industries and boost domestic businesses. It also brings in U.S. dollars to many formerly isolated countries. Expertise: ​Global companies have more expertise than domestic companies to develop local resources. That's especially true in mining, oil drilling, and manufacturing. 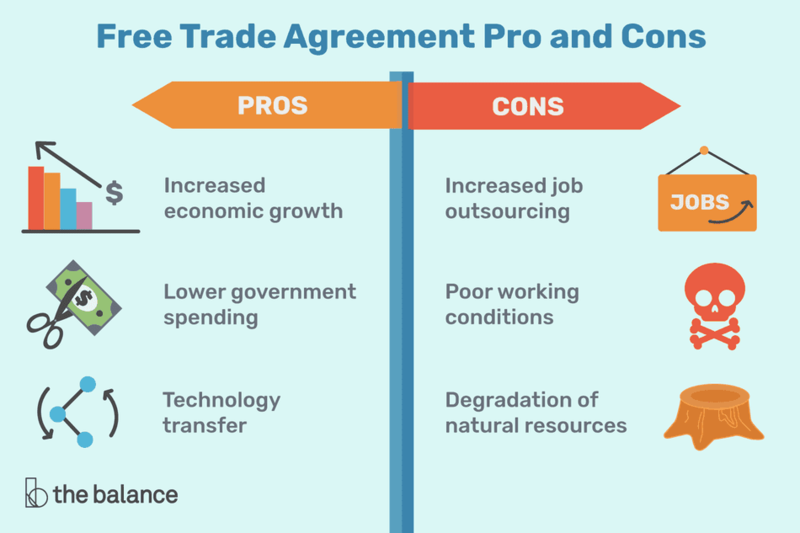 Free trade agreements allow the global firms access to these business opportunities. When the multinationals partner with local firms to develop the resources, they train them on the best practices. That gives local firms access to these new methods. Technology Transfer: Local companies also receive access to the latest technologies from their multinational partners. As local economies grow, so do job opportunities. Multi-national companies provide job training to local employees. Increased Job Outsourcing: Why does that happen? Reducing tariffs on imports allows companies to expand to other countries. Without tariffs, imports from countries with a low cost of living cost less. It makes it difficult for U.S. companies in those same industries to compete, so they may reduce their workforce. Many U.S. manufacturing industries did, in fact, lay off workers as a result of NAFTA. ​​One of the biggest criticisms of NAFTA is that it sent jobs to Mexico. Theft of Intellectual Property: Many developing countries don't have laws to protect patents, inventions, and new processes. The laws they do have aren't always strictly enforced. As a result, corporations often have their ideas stolen. They must then compete with lower-priced domestic knock-offs. Crowd out Domestic Industries: Many emerging markets are traditional economies that rely on farming for most employment. These small family farms can't compete with subsidized agri-businesses in the developed countries. As a result, they lose their farms and must look for work in the cities. This aggravates unemployment, crime, and poverty. Poor Working Conditions: Multi-national companies may outsource jobs to emerging market countries without adequate labor protections. As a result, women and children are often subjected to grueling factory jobs in sub-standard conditions. Degradation of Natural Resources: Emerging market countries often don’t have many environmental protections. Free trade leads to depletion of timber, minerals, and other natural resources. Deforestation and strip-mining reduce their jungles and fields to wastelands. Destruction of Native Cultures: As development moves into isolated areas, indigenous cultures can be destroyed. Local peoples are uprooted. Many suffer disease and death when their resources are polluted. Reduced Tax Revenue: Many smaller countries struggle to replace revenue lost from import tariffs and fees. Trade protectionism is rarely the answer. High tariffs only protect domestic industries in the short term. But, in the long term, global corporations will hire the cheapest workers wherever they are in the world to make higher profits. The best solutions are regulations within the agreements that protect against the disadvantages. Environmental safeguards can prevent the destruction of natural resources and cultures. Labor laws prevent poor working conditions. The World Trade Organization enforces free trade agreement regulations. Developed economies can reduce their agribusiness subsidies, keeping emerging market farmers in business. They can help local farmers develop sustainable practices. They can then market them as such to consumers who value that. Countries can insist that foreign companies build local factories as part of the agreement. They can require these companies to share technology and train local workers.